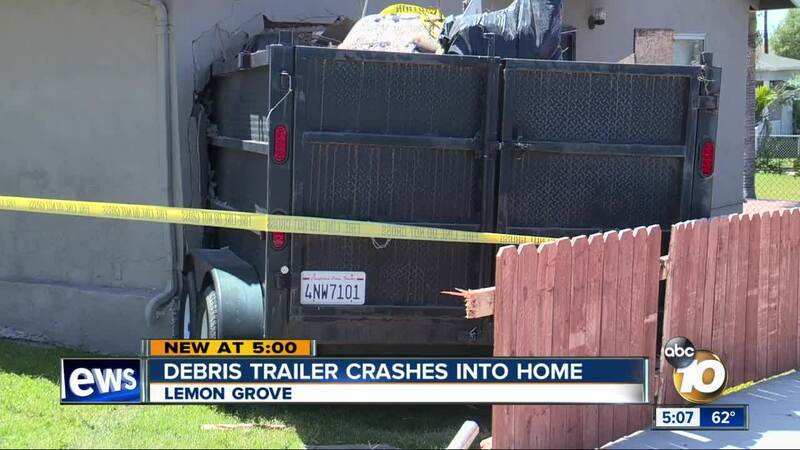 LEMON GROVE, Calif. (KGTV) -- A work trailer slammed into a home, nearly hitting a girl holding her baby sister in East County Monday afternoon. Just before 1 p.m. Monday a trailer filled with debris at a home under construction started rolling down the Palm Avenue in Lemon Grove. “It sounded like a crash at first,” said Abigail Jimenez, who was inside the home at the time of the crash. “I was inside and laying down in the couch and I hear some noise and something was beeping and it pushes my couch and my baby sister was with me,” Jimenez added. Fortunately, no one inside the home at the time of the crash was injured. The building inspector had to yellow tag the house, saying enough damage was done to the home to limit the family’s access. I was scared after I found what happened because it pushed us and I didn't know if it was a dream or not but thank God that we didn't get hurt or anything,” Jimenez said.